The event industry is constantly evolving, and we’re delighted to bring you a couple of new products here at Event Hire UK which are bang on-trend for unique events and occasions. Perfect for industrial warehouse style events are our brand new scaffold tables, available in a variety of sizes and heights. 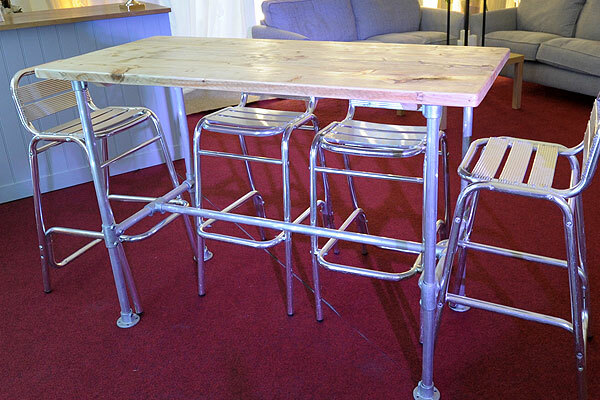 Called scaffold tables due to the fact that they are made from original scaffold poles and reclaimed scaffolding timber, few items of rental furniture are able to provide you with more of a WOW factor than these. Our 5ft scaffold high tables (pictured) are elbow height and provide an excellent alternative to the more traditional square or round poseur table, whilst our 8ft scaffold dining tables offer an excellent solution for event dining with a difference. Whatever your table hire requirements, don’t hesitate to browse our range online today and work with the experts. A member of our specialist sales team is available now and will be delighted to help you every step of the way to provide you with a seamless hire experience from the experts.